You all know I love the atmosphere of a race. This Sunday I got to have the race atmosphere in my own driveway, literally. The Inaugural Frederick YMCA 10-miler graciously included my address in their route. And to make it even more special, in my mind at least, we were perfectly situated at mile marker 5. The exact middle. The half-way point. Sweet. 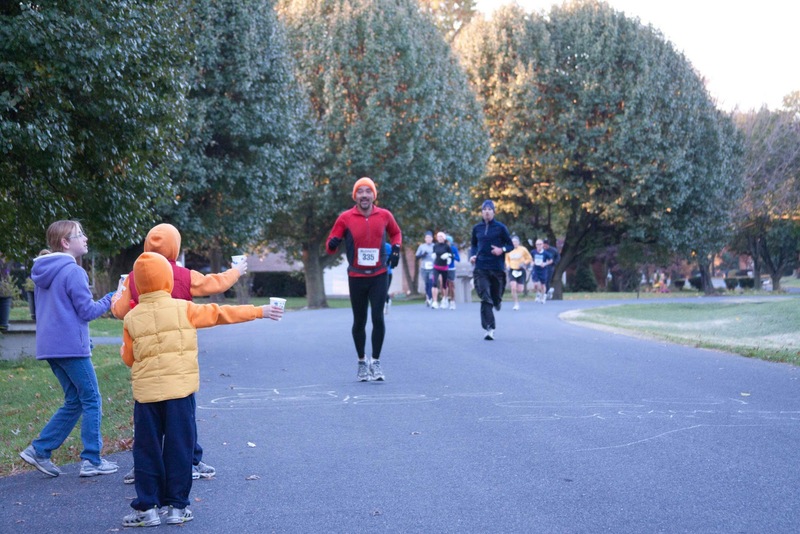 What do you do when a race is passing by your driveway? You get out there and cheer. And we did for the 300ish runners that passed by our house. Extra coffee was brewed, hot biscuits were baked and donut holes were purchased. All of this was for us, the spectators. We had to keep our energy up for all that cheering. And drumming. Yes, we had a snare drum going at 6:45 a.m. Sorry neighbors, but you did get that extra hour of sleep from the time change. And this race only happens once a year. So deal. As for the runners, in addition to cheers and a cadence, we had water (until we ran out of cups) and gummy bears. 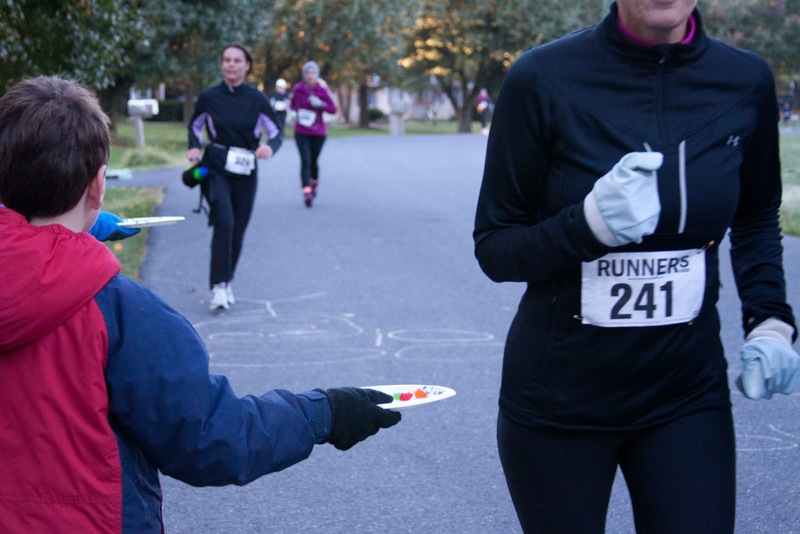 You've never seen an adult get so excited about gummy bears until you've met them with a plateful at mile 5. The runners loved having a cheering section. Really, who doesn't loved to be the object of a good old-fashioned cheer? Go! Go! Go! You Rock! We were joined by a few friends and our little group was the only set of spectators on our street. I hope next year there will be more. Maybe some of my neighbors could be challenged to make more noise than we do. Bring it on! It's gonna be awesome. It would only be better if I am actually running next year's race past said mile 5 and my personal cheering section is doing all of this for me. I'm not even half-way there yet in my running, but all it takes to get there is a little motivation, some Bon Jovi on the mp3 player and a little prayer can't hurt. That is so cool! That must've been so fun!